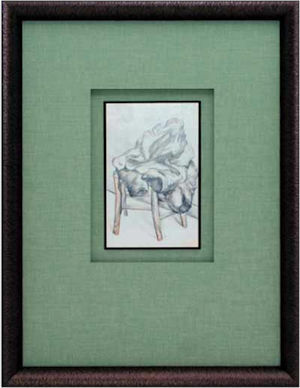 The washed linen texture of this soft green mat complements the artwork’s linear pattern. 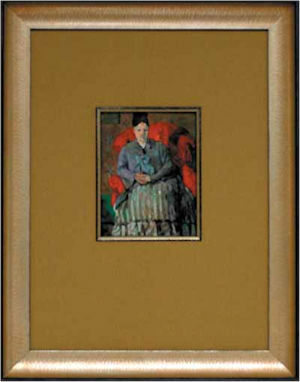 Selecting mats with the right texture and color are very important parts of frame design and presentation of art. Textured mats and rich colors offer an upscale look that can complement any home décor. The first consideration when framing artwork is to surround it with the colors, textures, and dimensions that will show it off in style. Great design involves choosing mats and moulding that bring out the best in the art. Textured mats are one of the most prominent trends today because they add a sense of depth and richness to the final design. Textures often exude a vintage look, complementing today’s home décor. Metallic textures make a bold, strong statement. Antique finishes in rustic pewter, tarnished coppers, and weathered golds are design alternatives to bright, shiny metallic tones. Textures today have an emphasis on creating a timeless, classic look. Mats with a crackle or gilded finish are ideal choices for folk art and antique prints. The texture adds life and quietly brings out the best in the artwork. Coarseweave fabrics tend to follow trends in fashion and fabrics, presenting creams and reds as well as blacks, golds, and soft greens. Silken mats provide texture and design elements. Mats featuring wide stripes and subtle patterns that mimic wisps of smoke create an interesting, eye-catching design. Quiet, subtle designs and textures on the mat create an added flavor to the art. Another favorite contemporary look begins with the French (decorated) mat. Adding a texture, color, or gold leaf to a French mat design can add new life to a classic look. Deep, warm earth tones and darker colors like eggplant, mossy green, or red are often chosen for French mats. Textured mats are offered in conservation and preservation-quality grades in assorted colors. Soothing yellow-greens, rich golden browns, and soft purples are popular color choices. A range of lavender tones have become new alternatives to gray mats. Bring your artwork to one of our San Francisco neighborhood shops and we will help you choose the right mat and texture to enhance your artwork. With the right mats, your art will look its best—and it will coordinate with the color and feel of your home décor.